Yesterday NHK reported the results of a pair of surveys it conducted mid-month asking public corporations about their business conditions and personnel plans for the year. The first was of leading corporations (shuyo kigyo -- with no definition as to what that means); the second was of small- and medium-sized enterprises (again no definition but the content of the survey would preclude the inclusion of no single employee proprietorships). The response rate for the leading corporation survey was fantastic: 100 companies of 100 surveyed reporting. The response rate for the SMEs survey mediocre: 201 out of 346 corporations, or 58%. What made two surveys particularly interesting was the difference in between the content and NHK's framing of it. Last night's 19:00 News 7 (Nyusu seben) broadcast -- the nation’s most-watched news broadcast -- began with a smiling Takeda Shin'ichi assuring the viewers, "We have some very heartening news tonight..." -- which made it sound as though something truly wonderful was about to be unveiled. - Of the 100 leading corporations surveyed, 10 were confident enough to declare an economic recovery underway. 86 of the companies were less certain, judging that the best that could be said was that a moderate (yurayaka na) recovery was underway. - Of the SMEs, less than 20% were declaring increased profits for the year. 46% will be reporting flat-lining results. 25% will be reporting decreases in profits and 8.5% will be declaring losses. - The two surveys found nearly identical levels -- 71% of large corporations, 72% of responding SMEs -- studying ways to raise take home pay. Not intending to increase pay, mind you, studying (kento suru) whether to increase pay and how to do it. These potential pay raise figures would furthermore be limited to remuneration for full-time employees -- no word on the remuneration of the nation's legions of part-time workers. - 32 of the leading corporations were considering raising pay using automatic wage hike mechanisms (teiki shokyu); 30 were considering raising bonuses and 11 were thinking of "increasing monthly compensation by some way or another." Only 9 of the 100 leading corporations were thinking of revising upward the numbers listed in the basic tables used to calculate remuneration (beesu appu). Given the lack of the measurement of definitive moves toward higher base pay, which would be indicative of the nation's corporate executives being willing to share an Abenomics-derived economic bounty, Takeda's bubbly intro seemed almost sarcastic -- and NHK generally does not have sarcasm in its tool kit. What is furthermore interesting in the SME survey are the high levels of performance reported. Only 8.5% of the NHK respondents were preparing to report losses. This would seem to stand in direct contradiction to known percentages of corporations declaring losses on the financial year. 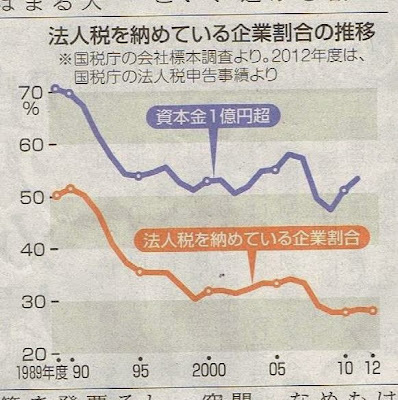 Below is a wonderful graph compiled by the folks at the Tokyo Shimbun of the historical trends of loss accounting as reflected in the percentage nation's corporations exposed to the corporate income tax. 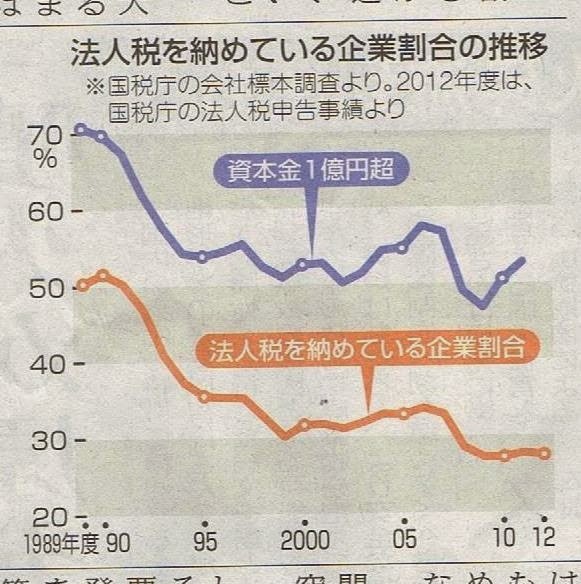 The red line is all corporations; the blue line, corporation with at least 100 million yen of base capital. As the graph shows, since the bursting of the bubble a steadily increasing fraction of the nation's corporations are fiddling with accounts so as to declare themselves unprofitable in the current fiscal year. In Fiscal Year 2011-12, the most recent year available, only 28% of all Japanese companies paid corporate income tax, with only about half of larger capitalized firms (53%) paying the tax. Self-selection of a particularly active kind is therefore taking place in the NHK survey. We can guess that a goodly number of the 42% of SMEs who failed to return the completed survey are companies with horrible books. We must also assume that the 46% of SMES reporting unchanged results have clever accountants who take potentially reportable profits and bury them in the bad ideas and dumb decisions of previous years. On a somewhat ancillary note, the Tokyo Shimbun graph should drive a stake through the heart of a particularly egregious misperception of Japan: the purportedly minor size of Japanese non-profit sector. 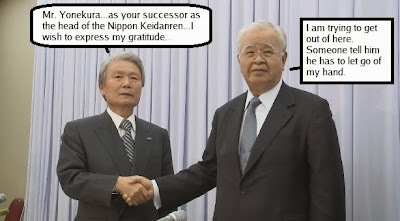 The clichéd complaint is that the lack of a large formal non-profits as they are known in the Anglo-American world -- the research centers, the foundations, the think tanks --represents a glaring weak point for Japanese society and Japanese capitalism. As the above graph illustrates, Japan's non-profit sector is not small. It is in fact HUGE -- with the majority of the country's non-government workers employed in enterprises that should be classified as non- or even anti-profits. This is pure MoF propaganda. Of course it cannot be the case that Todai-educated geniuses, who are, it goes without saying, infallible, have made a complete horlicks of the economy; no, it must be the case that the problem is Japanese private businessmen, who are, it is alleged, even better than the Greeks at not paying taxes. 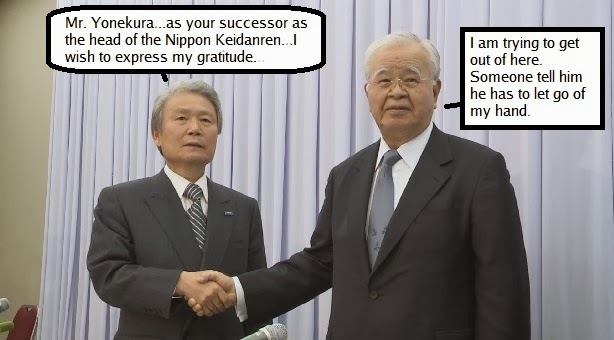 When a Cabinet advisor finally prevailed upon the MoF to produce the numbers for the scale of this alleged avoidance of taxes, the number was less than a trillion Yen. A rounding error and no worse than any other developed country. The reason many companies do not make any monney is that they can't. How could they when they have the MoF deflating the economy?